I’ve been offloading my excess emotional baggage and reclaiming my true self for over a decade and sharing that journey through my books, courses and this blog. 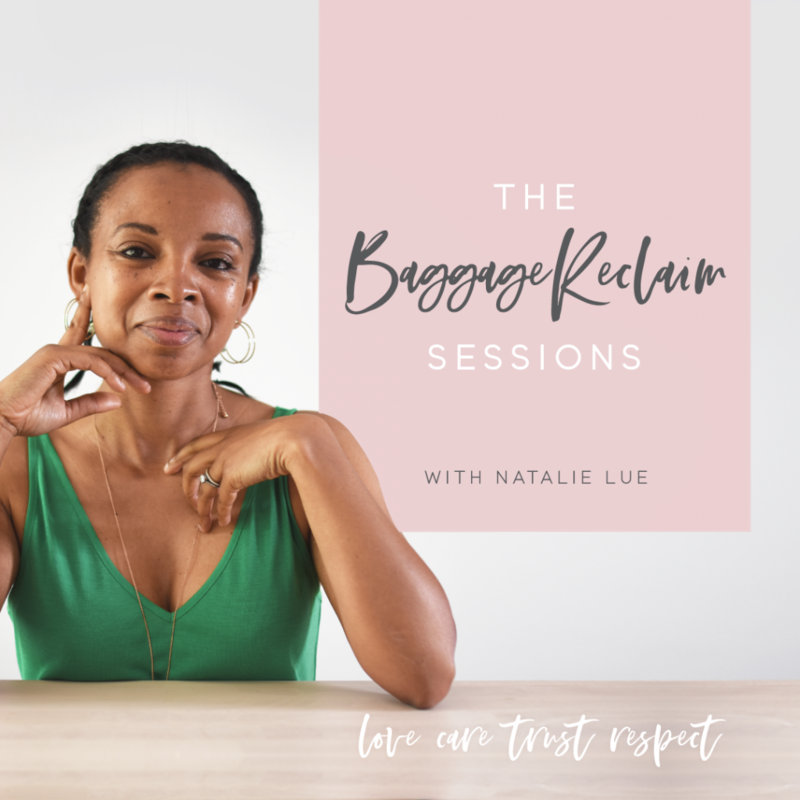 The Baggage Reclaim Sessions is a weekly podcast where I get up close and personal with plenty of inspiration and practices for living and loving with healthy self-esteem. If you’re new to podcasts and need to know how to subscribe or how to rate and review the podcast, see here. Ep. 1: Are You Doing It For The Right Reasons? Ep. 2: You Complete Me? Ep. 3: Who’s Afraid of The Big Bad Criticism Wolf? Ep. 4: Is Facebook The Boss of Our Self-Esteem? Ep. 5: Are Tricky Co-Workers Draining Your Mojo? Ep. 6: Are You Using Worrying To Focus On What You Don’t Want? Ep. 7: Are You Keeping Score? Ep. 8: Guilty or Not Guilty? Ep. 9: How Many Dates Does It Take To Be Exclusive? Ep. 11: Confronting or Confrontation? Ep. 14: Long-Distance For Love or, Long-Distance For Avoidance? Ep. 15: Fast Intimacy Now Or Build Deeper Intimacy Over Time? Ep. 26: Just Not That Into Me Or Unavailable? Ep. 28: Are you open or closed? Ep. 29: Do I accept you as my partner? Ep. 31: We’re Not Lazy! Ep. 32: Deal Or No Deal? Ep. 37: Are You Feeling It? Ep. 39: Make It Fly? Ep. 40: Going With No Flow? Ep. 41: Why Did We Break Up? Ep. 48: Why Him/Her & Not Me? Ep. 52: Moving In Or Sussing Out Whether To Commit? Ep. 54: We Were On A Break! Ep. 55: Are You Ignoring Me? Ep. 57: Save You, Save Me (Why Did We Break Up? Ep. 74: What Would Future Nat Do? Ep. 77: Get Me Out of The Friend Zone! Ep. 79: Too Bloody Nice For Our Own Good? Ep. 84: Am I Interested In You? Ep. 87: Jaysus! What’s Up With All The Life Lessons, Professor Life? Ep. 88: You’re Not The Boss of Me! Ep. 91: Who’s In Your Entourage? Ep. 93: Am I Lying To Myself? Ep. 96: Is It Time To Go On a Social Media Diet? Ep. 101: Help, Support, or Fuzzy Boundaries? Ep. 103: Trial & Error, Baby! Ep. 104: Did We (Or They) Meet The Threshold For Pursuing Romantic Interest? Ep. 114: Have I Outgrown My Friendship? Ep. 118: Will The Real You Please Stand Up? Ep. 119: Will The Real You Please Stand Up? Ep. 120: Dear Friend, Why The Distance? Ep. 121: Dear Friend, Why The Distance? Ep. 124: Is it a bird? Is it a plane? Nope, it’s emotional unavailability! Ep. 134: Did You Just Shut Down My Boundary? In every session I ask my listeners to submit their questions. If you’d like to get involved send me an email to podcast at baggagereclaim dot com (replacing the at with @ and the dot with a .). You can remain anonymous. Like what you’re hearing? Please take a moment to leave a review, find out more here.